Doors have opened at the new £1.5 million Foundry Film Studios in Salford. 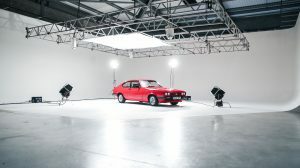 The 8,000-square foot purpose-built venue on Ordsall Lane has been designed for the creation of TV and advertising content, as well as photo shoots and events. Its 10-strong staff is being led by managing director James Shannon, who is 28, and 23-year-old Madeline Penfold. Shannon said: “Our combined ambition was to create a space which is ultimately an artistic hub and where collaboration is at the core. “We wanted to make it feel like a home-from-home environment and develop an alternative to the cold, un-welcoming feeling that is so often found in a lifeless empty studio. “We have built a space where traditional workflows can be broken and a place where we can continually adapt to the needs of our clients. The TV industry has evolved and boundaries are constantly being pushed. Foundry Studios is home to two expansive studios, with one containing one of the largest infinity coves in the northwest. There are also edit facilities, dressing rooms, creative breakout areas, a mezzanine platform, bar area and its own in-house collective of directors, producers and editors. Foundry Studios’ in-house team is already working with fashion and retail clients producing content for TV and online. Jason Tyldesley, CEO at Sofology, who recently used the facility said: "Foundry Film Studios have created a production space and workflow that allows Sofology to not only shoot the big TV campaigns, but to also turn around high quality, high volume product films on a continuous basis”. The Foundry Film Studios will host an official launch party on Thursday 27th October.